Budgies are known as beginner birds because they are playful and easy to care for. Just because they may not be as high-maintenance as other birds, however, doesn’t mean they are any less deserving of top-notch care. Caring for your budgie means providing a healthy, high-quality diet that will meet your bird’s nutritional needs. Keep reading to learn more about budgies and their nutritional needs. You’ll also see our top 5 picks for the best bird food for budgies. What Do You Need to Know About Budgies? How Much Should You Feed Your Budgies? How Many Times a Day Should You Feed Your Budgies? The name budgie is a shortened version of budgerigar, but this bird is more commonly known as the parakeet. Parakeets are a very popular species of pet bird, known for their manageable size and their affectionate nature. Some budgies can even learn to mimic human speech. Though the term budgie can be used accurately for any parakeet, there are different kinds of parakeets and not all of them are budgies. Budgies are one of the smallest species of true parrot, growing only 7 to 8 inches long from their beak to the tip of their tail. Some parakeets, on the other hand, grow much larger – up to 16 inches from head to tail like the Indian Ringneck Parakeet. There are actually two types of budgie. The traditional Budgerigar comes from Australia and is smaller than the English budgie which was bred in England for the show and pet trade. The most common color for budgies is green because it is their natural color, though budgies bred for the pet trade come in a wide range of colors. In addition to being very colorful, budgies are easy to care for, but they do have specific dietary requirements that go beyond simple birdseed. Budgies are relatively inexpensive pets simply due to their small size, but they do have specific dietary requirements. A diet consisting only of seeds will not provide the whole spectrum of nutrients a budgie needs to be healthy. 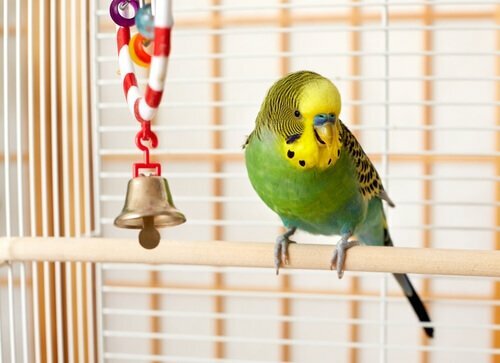 A vet-recommended diet for budgies includes seed, pellets, fruits, and veggies. Nutritionally balanced pellets. Pellets are the ideal diet for budgies because they are nutritionally balanced – they should make up 75% to 80% of your bird’s daily diet. Several types of seed. In the wild, budgies eat a wide variety of seeds, so if your budgies eat seed make sure to choose a blend that contains several types of seed. Fresh fruits and veggies. About 5% of your budgie’s diet should be made up of fruit and 10% to 20% from fresh vegetables like leafy greens, peas, carrots, broccoli, and sweet potato. Low grit. Some birds require the addition of grit in their diet to help them digest their food, but budgies tend to remove the husks from their seeds before swallowing and therefore do not require much grit in their diet. Keep reading to see our top 5 recommendations for the best bird food for budgies. The best food for budgies will be nutritionally balanced which generally means pellets. If your budgie won’t eat pellets, you’ll have to find the right balance of seed, grains, fruits, and vegetables to ensure that your bird gets the nutrients it needs. If you choose to feed your budgies a varied diet rather than a pellet, this Living World Premium Parakeet/Budgie Mix is a great choice. This formula features a blend of seeds, fruits, and vegetables to provide complete and balanced nutrition for budgies. It is enriched with essential nutrients as well, so you don’t have to worry about your budgie missing out. Plus, it promotes vibrant feathers and strong bones, so your budgie looks and feels its best. When variety is the name of the game, Dr. Harvey’s bird food is the brand to trust. Dr. Harvey’s Our Best Parakeet Food All Natural Daily Blend features a combination of 13 types of seed, 9 types of nuts, and 12 types of fruit and vegetables to provide your budgies with a highly nutritious, varied diet. This seed blend uses ultra-premium ingredients to ensure bright, vibrant plumage and healthy vitality in your pet bird. It is loaded with the flavorful ingredients budgies love as well as essential vitamins and minerals. The only thing it doesn’t contain is chemicals, dyes, and preservatives. 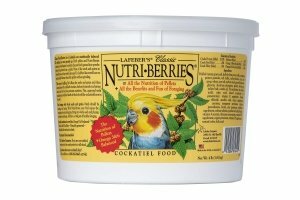 If your budgie loves to forage, this Lafeber’s Classic Nutri-Berries Pet Bird Food for Parakeets is a great option. It combines the balanced nutrition of pellets with the benefits of foraging for your bird. This formula is nutritionally complete and balanced, enriched with essential vitamins and minerals for healthy immunity, vibrant plumage, and strong bones. Plus, the unique nutri-berry clusters help prevent bird boredom and feather picking by appealing to your budgie’s love of foraging. If you prefer to feed your budgies a seed blend, this Volkman Seed Company Avian Science Super Parakeet Diet is a great option. It contains a wide variety of seeds including millet, canary grass, flaxseed, and other known favorites. It also contains the Volkman fruit mix as well as vegetable supplements to ensure complete and balanced nutrition. for ideal freshness and flavor. 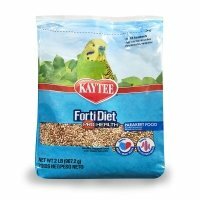 For a budgie food that goes above and beyond minimal nutritional requirements, try this Kaytee Forti-Diet Pro Health Parakeet Food. This seed blend contains a wide variety of ingredients that budgies love but also includes beneficial supplements to support healthy digestion. Because the budgie is a fairly small bird, it doesn’t require a large volume of food. Most budgies do well on 1 ½ to 2 teaspoons of seed per day, depending on their size. If you have more than one budgie in the cage, you should provide separate dishes for each bird. Birds typically establish a pecking order, so providing one food dish per bird ensures that all of your budgies get the food they need. Most budgies prefer to graze on food throughout the day, so you should offer your budgie food once a day and let the bird eat it as it likes. To keep the food fresh, only offer your budgie one day’s worth of food at a time and clean the dish before feeding it the next day. Balanced nutrition is important for all birds, but small birds like budgies can sometimes be a challenge because they eat a lesser volume of food. Nutritionally balanced pellets are the best way to meet your budgie’s dietary needs, but if your bird is currently eating seed, you may need to transition it onto a pellet-based diet supplemented with seeds, fruits, and veggies. If you’re not sure where to start shopping for budgie food, try one of our top 5 picks reviewed above!